"The convention scene, especially the Anime and general media conventions, are giant career engines. There's networking, there's portfolio reviews, and there's huge amounts of panels and events. So I figured I'd create a guide based on all the events I'd seen - or hoped for - to help people brainstorm more ways to help their fellows in their quests for careers"
Conventions. Cons. Minicons. Relaxacons. Megacons. The Convention Scene is part of the culture scene for fans, geeks, otaku, and more. It's also the place that many people get a chance, perhaps a first chance, to get some insights on their dream careers. It's also the place where others may find career hopes rekindled yet again by the right panel or workshop. This book is a guide to making those very events, debates, and happenings to help people's career hopes come alive, or be brought back to life. 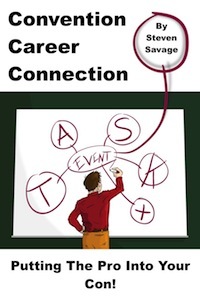 This is a book on creating career events at your next convention! With a simple five-part system, Convention Career Connection helps you come up with unique and interesting ideas for job, career, and professional happenings at your next con. Containing extensive suggestions and resources, as well as specific advice on the many options ahead of you, you can be sure to work out the best way to help your attendees in their ambitions! Interested? Download the sample today and see what aways you! TASK+ Planning Sheet - A one-page design sheet to use with the book to help you design events! Convention Event Brainstorming Sheet - Based on Chapter 3 of the book, this is a handy document to print, fill out, and brainstorm career events.